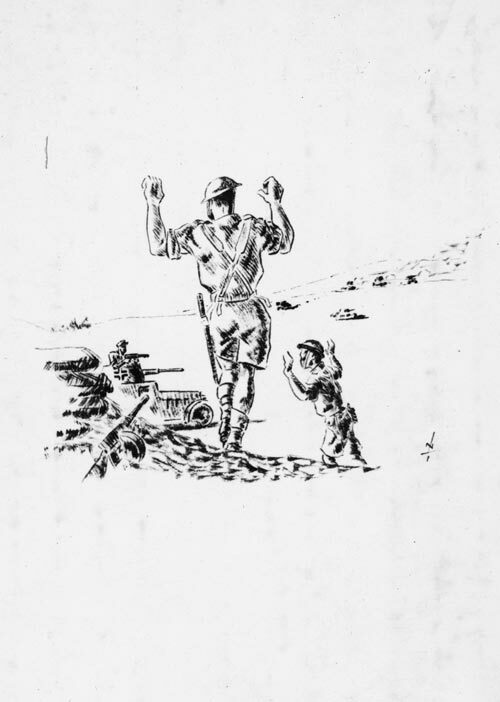 In 1945, on his voyage back to New Zealand, Nevile Lodge made this sketch of his capture at Ruweisat Ridge in Egypt on 15 July 1942. Ruweisat Ridge was a small promontory about 16 kilometres south of El Alamein. There had been a strong counter-offensive from the Axis forces and capture of the ridge would have aided the Allies. The New Zealanders took part of the ridge early on 15 July, but British armour and artillery were unable to assist them, and 350 men, including Lodge, had no choice but to surrender.